This entry was posted in Food Glorious Food, Rambles, Waffles and Digressions and tagged berries, birthday cake, grandfather, mascarpone, memories, meringue, pastry by cityhippyfarmgirl. Bookmark the permalink. Thanks Joanna. He really was a wonderful man. No wonder you had an exceptionally special bond with your grandfather. Your words really painted a well loved image of him. I find posts like these really valuable. Especially for your children, as later in life they may read this and learn more about you, your grandfather and even themselves. (At least that’s what my ‘grown’ kids are telling me). Now that’s a lovely Delicious magazine compliment Mariana, thank you! And thanks for the birthday wishes. Happy happy birthday!!! My day too!! altough I´m not a young woman and mom, but from time to time I read your posts and look at your beautiful pictures!! Have a nice day!!! I´m now going to prepare my cake…. your berry tart looks yummy!!!!!!!!!!!!!!! Thanks for popping in to read Ale and Happy Birthday to you too. A happy birthday (if late)! I’m sure your grandad would have loved that cake. It’s pretty amazing to think how we associate our memories isn’t it. Whether it’s attached to a smell, a sound or a visual. Happy birthday. It sounds like you had a very wonderful and very special grandfather. It’s a shame we don’t live longer. That is a very beautiful looking berry tart. Thanks hotly spiced. It was fun putting the tart together, and a good one for summer. And they say only the good die young! Your grandad sounded wonderful. I envy (in a nice way) your relationship with a grandparent, I had none but wish I had. Even my own son has had none close enough. But yours sounds extra special. Good for you. Your post was excellent, well written, it really got me in. Thanks Dayla. I am lucky to have had/have grandparents…incredibly lucky. Vegemite toast in bed is a treasured memory. I’ll bet your grandfather loved that time just as much as you did Alison. What a sweet post in more ways than one. I think the tart will be making a re-entrance at some time. What beautiful, beautiful memories 🙂 Definitely ones to treasure. And a big happy birthday to you!! Gorgeous cake and I hope you had a wonderful day. Happy Birthday Girl! Your grandfather sounds like a great man. Thanks mama, he was quite a character. Happy Birthday Brydie, and to your lovely Grandfather – it sounds like he was a wonderful, wonderful man – just like a grandfather in a story book! You obviously have some very precious memories of special times shared with him. People may die, but love never does. He will live on forever in your heart, and by sharing your lovely stories and memories, he will continue to live in the hearts of your children. It’s funny retelling stories about him to my eldest. He seems to enjoy the stories as much as I enjoy telling them. What a blessing to share such a precious day with your grandfather- and what a special bond you shared with him that has continued with your memories- even after he has passed on! I had no grandparents, but I loved my dad so exclusively that the memories I have of him are like diamonds. He died when I was sixteen and each memory has made my life richer. I’m making this for Thanksgiving with fruit from Chili. It isn’t local- but I can’t wait until summer for this one! I’d love to know how you go with it Heidi. It does have a certain celebration wow factor about the tart…and i think your thanksgiving might be this weekend?? No, not for another week or so. The last Thursday in November. I am so far behind- we have a wedding for my nephew, I’m flying into NYC the first of December and then Christmas back in Virginia- I hope I am up for all the ancillary activities that go with the events! Happy Returns Brydie! Love bonds last for ever and when our beloved grandfathers & grandmothers become angels they care for us and share with us our earthly joyful moments! My love to you and your family! Thx for sharing with us your tender memories and your recipe! Congrats for your lovely cake! Good morning from our frozen hellenic island of Kos! one word. YUM! when all my berries ripen, Im on this! Happy Birthday… this cake is such a loving tribute to your grandfather. He would be so proud of all that you have accomplished… what a special man he must have been. This brought tears to my eyes. I think he would have quite enjoyed reading it too. Happy birthday! I’m sorry your grandfather isn’t there with you. I can’t imagine losing my grandfather – he’s like a second father to me. This tart looks incredible! Happy Birthday! 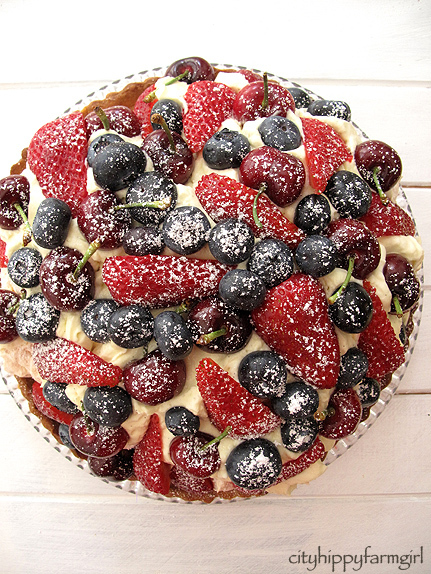 That looks like a stunning cake, a generous helping of fresh berries always make things look special. Happy birthday , Brydie. I was so touched by your story about your grandfather….you really brought childhood to life in your descriptions of how you felt at the time. I talk to my children about my grandfather all the time and his memory stays alive in our little bedtime conversations about this special man. Thanks for a lovely recipe and leaving me with a sense of who you are because of the lovely presence this man had in your life. Kim those bed time conversations are gold aren’t they. When I was little, I used to love hearing stories from my grandmother’s ‘olden days’, now it’s my turn to pass these on. These stories do keep those memories alive, and I love that. What a lovely tribute to your grandfather, Brydie. It has made me a little envious as I never knew either of mine. And I’m sure he would have loved a slice of that tart – as would I. That was a moving tribute to David and gave me gooseflesh as it brought back lots of lovely memories for me too; the distant cousin whom he sought and found on his exploration of our amazing family tree roots to Sri Lanka. His legacy for me is the connection he gave us and our children which would please him no end. You remind me so much of him with your amazing creativity, writing skills and love of exotic food which you so generously share with us. It is so appropriate that you share a birthday with him, He also loved “lime pickle” a Sri Lankan delicacy that he could never get enough of and yes he would have loved your cake too. He lives on for me too every time I work on our family tree and the wonderful memories of him that I treasure. Thanks for the memories. No words Frederick… thank you. –This tart is PURE ART. I hope you had a wonderfully happy birthday. Such a gorgeous recollection of your grandfather. Happy birthday. Your grandfather sounds like a very special person – thanks for sharing your memories of him with us. Brydie, a truly beautiful tribute to the memory of someone who clearly made you feel so loved, happy and secure. It brought back memories of my own grandmothers and the preciousness of the times we spent together. Happy birthday my friend. I loved the story of your grandfather. He sounds like he was a wonderful man. 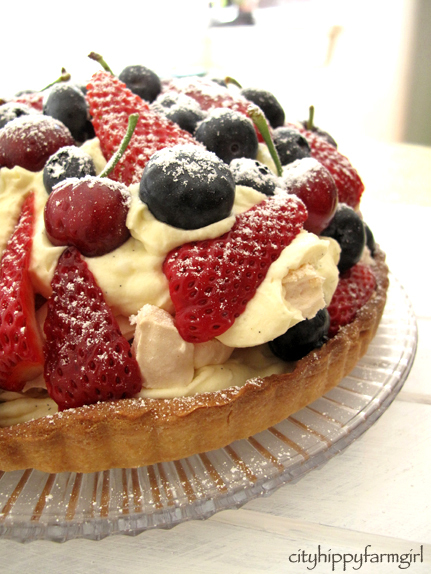 The birthday tart looks beautiful…I love meringue. I would be thrilled to have that tart for my birthday! Happy birthday! A wonderful looking summer birthday tart – just perfect!